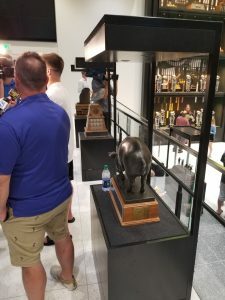 IOWA CITY – First-time visitors to the Iowa football complex wouldn’t notice anything out of place in the building’s public atrium. Every trophy case seems accounted for but looks can be deceiving. Somewhere hidden out of sight in storage is an identical black display. The Hawkeyes are looking to put it to use in the near future, Saturday night if we want to be more specific. It may require some rearranging, some football feng shui if you will. Iowa will host Wisconsin at Kinnick Stadium this weekend and in addition to bringing the stings, scrapes and scars of a 24-21 home loss to BYU down Highway 151 with them, the Badgers will also be toting along with them the Heartland Trophy. It was won here in 2016 and easily retained following a 38-14 Wisconsin victory last November in Madison. That game, which came a week after Iowa’s most memorable victory of the 2017 season, served as a low point for the Hawkeyes. Sixty-six yards of offense was all the Hawkeyes could manage to muster that day, rushing for a season-low 25 yards. Were it not for a pair of interceptions returned for scores by defensive back Josh Jackson the Hawkeyes would have been shutout on the scoreboard. Not surprisingly, Iowa’s players preferred to keep their focus on the present rather than relive the past as they met with the media Tuesday. Last weekend’s victory over Northern Iowa hinted at the fact the Hawkeyes are on the verge of putting things together offensively. Still, this is Wisconsin and despite some injury concerns the Badgers will still bring with them their typical stout defense. Through three contests this year opposing teams have managed just 13.7 points. That’s a tick below the 13.9 per game allowed by UW last season, which ranked third nationally. Additionally, the Badgers will have recent history on their side Saturday night. They’ve won their last four games at Kinnick Stadium dating back to 2010 and own wins in five of the last six meetings for the Heartland Trophy. That includes a statue bearing the likeness of a brass bull (which, technically, is really a steer). Should the Hawkeyes earn it Saturday night there will be a place for the trophy inside the football complex. Until then the empty display case, like the rest of us, awaits the outcome of Saturday night’s Big Ten West opener for both teams.